A muscle car should give you power, comfort, and pristine technology, and the 2018 Dodge Challenger gives you all of these things and so much more. Dodge is continuing the tradition of the Challenger by giving you even more trim options with the addition of the SRT Demon. The SRT Demon holds the record for the fastest quarter-mile by any production vehicle. This new trim is perfect for the drag-strip, but you better purchase this model quickly, as there is only a limited number available. Other new items for 2018 include a standard rearview camera, along with Android Auto and Apple CarPlay. Optional upgrades for 2018 includes a new handling package for the 5.7-liter engine and a new SRT Widebody. The SRT Hellcat receives some upgrades with new leather interior, new grilled badges, a new fender, three colors for brake calipers, a new wheel finish, and Brass Monkey wheels. What powertrains are available with the 2018 Challenger? You are not looking to buy a Dodge Challenger simply to have it sit in your garage. 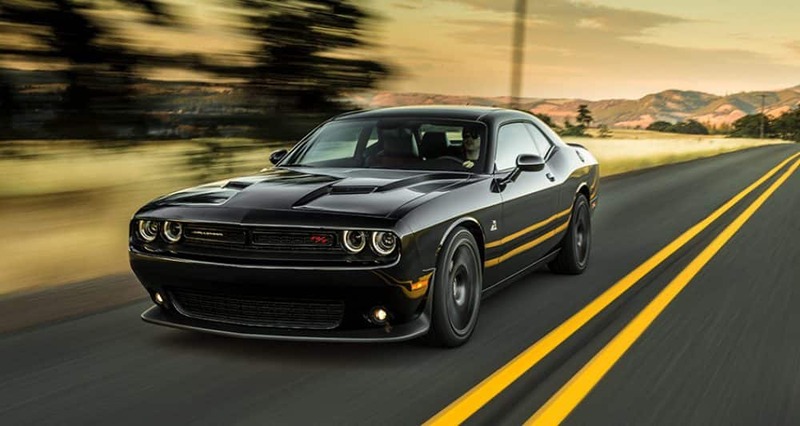 You are looking to buy a Challenger because you want to be able to press your foot to the pedal and understand what it means to be in control of that much power. This Challenger gives you four different engines to choose from, starting with the 6.4-liter V6. This 6.4-liter gives you 485 hp and 475 lb-ft of torque while working with an 8-speed automatic transmission and having the fuel efficiency of 30 miles per gallon on the highway. Another engine option is the 6.2-liter V8 which can be found in the SRT Hellcat and creates 707 horsepower and 650 pound-feet of torque. The next engine available comes with either a six-speed or eight-speed automatic transmission and is a 5.7-liter V8 engine. Depending on the transmission you can achieve 372 horsepower and 400 lb-ft of torque or 375 hp and 410 lb-ft of torque. The last engine comes with the SRT Demon and is a 6.2-liter V8 engine that gives you 840 horsepower and 770 lb-ft of torque with racing fuel, and 808 horsepower and 717 lb-ft of torque with premium unleaded. What safety features are in my 2018 Challenger? Muscle cars are not just concerned with bringing you a powerful ride. In 2018, the Dodge Challenger is also concerned with giving you a safe ride. In order to do that the Challenger is giving you options to add on safety features, such as xenon high-intensity discharge headlamps, blind-spot warning accident avoidance system, and front and rear ventilated disc brakes. The standard features that you will receive no matter what are stability control, child seat anchors, post-collision safety system, front and rear head airbags, dual front side-mounted airbags, and emergency braking preparation. What does each trim level offer me? Besides your need for power, the 2018 Challenger feeds into your need for options when it comes to trim models. No one wants to be forced into one vehicle without the ability to choose, and Dodge is making sure you can choose. The first option is the base trim, known as the SXT. The SXT gives you a six-way adjustable power driver seat, a rearview camera, dual-zone climate control, keyless ignition and entry, Apple CarPlay, heated mirrors, a 60/40-split folding seat, and Android Auto. Another option is the SRT 392, which offers a Harmon Kardon 18-speaker audio system, blind-spot monitoring, xenon headlights, adaptable suspension dampers, ventilated and heated front seats, configured driving modes, and even leather interior. The next option for trims is the R/T, which offers active sport exhaust, limited-slip differential, and fog lights. The trims continue with the GT, and this one gives you ambient lighting, an 8.4-inch touchscreen, extra car apps, rear parking sensors, HD radio, satellite radio, heated front seats, power and heated adjustable steering wheel, and leather upholstery. The next one is the R/T 392, and this trim offers rear parking sensors, performance brakes, an Alpine audio system, sport-tuned suspension, and new car apps. Finally, there are two other trim options called the SRT Demon and the SRT Hellcat which give you impressive powertrain options and allow for a large amount of additional power. A muscle car should give you power, speed, technology, and comfort. The 2018 Dodge Challenger is sure to bring you every single one of those attributes and so much more. There are many different trim options, especially with the addition of the SRT Demon which brings drag-strip attributes to an already impressive trim lineup. Have more questions? Use our form below to ask as many as you would like! Or, you can schedule a test drive with us today and experience the 2018 Challenger yourself.